This time of year the word is “mum”, or more commonly “hearty mums”. Recently, I accompanied a priest friend to a garden center to get some mums to beautify the parish grounds. There was certainly less color on offer than in the height of summer, but the mums were ready. Among the mums, birdbaths, assorted metallic orbs and such were a few statues. There was a statue of the Blessed Mother, looking as close as possible to her image titled Our Lady of Grace; arms opened downward in a gesture of graces being shared. St. Francis’ statue was there with depictions also of birds on his shoulder. This is Holy Father Francis in the act of preaching to the birds. The third figure was of a bearded hooded man holding a shovel. My guess is that a number of people have probably looked at the saint with the shovel and thought it simply to be Saint Francis, ready to work. This saint, however, is the patron of gardeners; his name is St. Fiacre (d.670). Fiacre was a native of Ireland known for the holiness of his life. He attracted disciples who wanted to learn the disciplines of following Christ. The crush of visitors and those looking for a mentor drove Fiacre away from Ireland to France where he hoped to live more alone with God alone. It is not hard to imagine an Irishman shoveling out manure. But, the origin of Fiacre’s held spade lies in the legend that the Bishop of Meaux, St. Faro, offered him as much land as Fiacre was able to dig a furrow around in one day. He apparently dug quickly and acquired enough land on which to build an oratory in honor of the Blessed Mother, a place of rest for strangers, and a cell apart in which he lived. His property was thus set aside for prayer, contemplation, and active charity. Centuries after his death, his remains were reburied in the Cathedral at Meaux where his relics were visited by many including Bossuet, St. Vincent de Paul, and Anne of Austria. 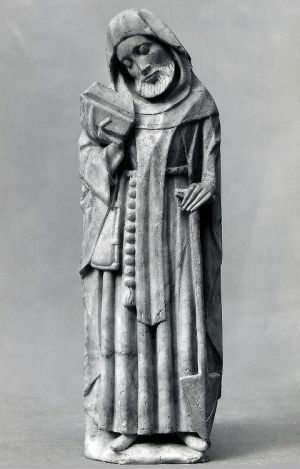 Cardinal Richelieu kept a vertebra of St. Fiacre as a relic. Perhaps the Cardinal knew something about back pain from garden weeding. In Paris horse-drawn carriages for hire came to be known as fiacres because of their business first being offered outside the Hotel St. Fiacre. Horse drawn cabs in Egypt are also called fiacres and a variety of cab in Vienna is called fiaker. St. Fiacre is therefore the patron of taxi drivers. From the birdsong solitude of the garden to horn blown streets we find a common patron. In Ireland his feast is celebrated on September 1st. Wish your gardener, gardening loved ones, or your cabbie a happy feast of St. Fiacre, they, like him, probably love and long for solitude.